[Interview] ByuN: "It was by far the best day of my career." We were lucky enough to be given the opportunity to sit down with ByuN for a group interview shortly after his WCS Global Finals win at BlizzCon. Thanks in particular to Mal for interpreting for us and facilitating the whole process. Q: Let’s start with the obvious question: You’ve just won the BlizzCon World Championship, you’ve just won the GSL; how are you feeling? A: Winning GSL is obviously a great honour; it’s a great title to have as a professional gamer. BlizzCon though—need I say more? Maybe it’s because the prize is so big—$200,000 compared to what GSL is—and that might have played a role in it, but the biggest part of winning and what I’m going through right now is that there are so many fans today compared to yesterday. It was unbelievable, and after every set that I won, I felt like I could hear everyone, all my supporters cheering for me. It was electrifying, and it was by far the best day of my career. Q: How was it to win BlizzCon as the only terran remaining? A: It’s funny, because I knocked the other terran out. There were only two, but then I cut his tournament hopes. I made myself the rarity, and it’s just great. Q: Your opponent Dark fought hard; the match was pretty close. Can you give some thoughts on your opponent, and how you felt during the series? A: The funny thing is that I didn’t really have much time to practice; I had 15 minutes after my semifinal. But I had one match against zerg in this tournament, against viOLet, whereas Dark didn’t have a chance to play against a terran at all. So I felt like that was an advantage that I thought I had, and that’s how it played out. Q: On Frozen Temple you used your reapers to delay the ravager push. Was that something you’ve practiced specifically? A: I’m the creator of that triple rax reaper strat. Others may say something else, but I made that build. And I made it so that it can be as versatile as it can possibly be. I’ve never lost defending against any sort of pushes or any types of composition using that build, it’s the most confident build that I have. I never really thought I was going to lose, but you know, Dark is Dark—he’s the other guy who made it to the BlizzCon Finals. He had a lot more units than anyone else that I’ve met, but luckily my stimpak was done. It was mostly down to the build I created though. If the attack failed, then there was a Plan B, a Plan C, so I was confident enough. Q: I noticed that especially in the later games, like game 5 or 6, that you were making a lot of misclicks—you lifted your CC, you stopped all your SCVs when trying to make a supply depot, you cancelled a factory, you made an engineering bay instead of a barracks sometimes—was that due to nerves, or just because of how fast you were playing? A: I don’t make a lot of mistakes when I play. One thing that caught me off guard was that I’m pretty confident when it comes to multiple harassments, multi-prong attacks, or defending and attacking simultaneously, but one of the things that surprised me the most was that Dark was superb at it, just as good as I was. In terms of little mistakes, it’s not because my hands are moving fast, it’s just how I’m accustomed to working out my sim cities, to see what that building block is. I think that my only real mistake was lifting that CC and stopping those workers for around 30 seconds. Q: Over the course of the series, you were up 3-1 until you got to Game 5. Then it looked pretty good, you were ahead at some points, but then Dark came back and ended up defeating you when you were one game away from winning. Can you speak towards your mentality there, or how it affected you in the next game? A: Like I said up on the stage, I’m a big baseball fan. Just like the Cubs and the Indians, I was 3-1 up, and he came back. I had a brief moment of doubt, saying: “Am I going to give up this 3-1 lead?”. And then I thought to myself: “Not a chance”. On Frost, what was interesting was that maybe Dark did something wrong, but he just didn’t have a lot of units. He didn’t have as much unit production as I had imagined, and I really don’t know how I won that game. Because I thought that Dark would come a lot stronger than he did, but he didn’t. Q: How was your preparation for your semifinal today? A: For the semifinals, I didn’t have a lot of time to practice to go up against Stats. I asked Patience, who had been knocked out of the tournament, if he could help me out, and in a heartbeat he said he would. Then I showed up at 8am, and he wasn’t here. He texted me at 1pm saying sorry, but luckily I’d also asked Neeb if he could help me, and unlike Patience Neeb was there at 8am sharp, and he really helped me prepare against Stats. Q: What is it about Legacy of the Void in particular that’s enabled your career to kick off at this point? A: It’s not anything in particular about LotV, but towards the end of Heart of the Swarm I practiced a lot, and my skill level was up there amongst all the big name players. I was confident in HotS, but just the timing of it meant that I wasn’t able to compete in a tournament in HotS. Luckily for me, a lot of big names came to BlizzCon 2015, practicing HotS, whereas I was at home—I basically started LotV from the closed beta itself, so I had the advantage of practicing from the start. Q: What players do you think have influenced you the most in terms of your style, and what do you think makes you unique? A: That’s a funny question, because I don’t really have anyone that I was inspired by, or learned from, and the reason I say this is because I’m actually the first guy who started Starcraft II. When Wings of Liberty came out, I was one of the first ones to hop on that ship. I have my own style. In terms of players I’m inspired by and have learnt from, I suppose that part of it is that I compete in Korean tournaments. And because of that, I look at a lot of foreigner terrans like uThermal or Beastyqt, because Korea really has a regional style. That’s what everyone studies to prepare for tournaments. But if I bring in some of the aspects of foreigners, then that changes the game. And I feel like that’s how I stay up, but it’s not like I get inspired or really learn from them. I try to fix it, then put my own unique style on them. Q: You used to be known as GhostKingPrime; where are the ghosts? A: I really want to watch what I say here! It’s not like ghosts were nerfed, they’ve just changed. A lot of great players had great use of ghosts in-game, but how it’s changed is that it’s really difficult to tell if someone’s good at using ghosts or not. It’s just what it is. I really hate this meta, I just can’t use ghosts; it doesn’t make me look good anymore. Q: At the start of the year, it had been about 14 months since your last match on LAN. Did you ever think that you’d make it to this point? A: I swear to god; stage fright never goes away. I just can’t get used to going up on the stage and playing. If I make it to the Round of 8 or the semifinals in any offline tournament, then I’m satisfied enough. To prep for that, I participated in a lot of online tournaments, even more so when everyone was still working on HotS, trying to get as much experience as I could, and trying to learn and adapt to make it feel like home. I might be overstating myself when I say this, but I practiced the most with LotV compared to any other player out there. I’m confident that I’ve put in the most hours and effort, and I feel like it’s a nice reward after all that hard work. Q: How do you see Starcraft in Korea changing as we move into a post-Proleague era? A: I never really played in Proleague; I don’t know what it’s like to play for a Proleague team. Prior to this, all the fans, everybody in this industry, saw those players on KeSPA teams as having stable jobs, a much better environment for practicing, whereas I was never really given that opportunity. For the past two years, I’ve been playing from home, practicing by myself, and I was able to get this far. Now I’m comfortable with it. I don’t feel that having a team or a stable environment necessarily gives you an advantage. It might for others, but for me, I’ve never experienced it and I’ve been able to come this far, so I don’t really think I need it. I give my sincere good luck to all those guys there. Now you’re going to be coming out of that shell, you’re going to be alone without a team, your future will look very dark [Note: Interpreter confirms at this point that this was not an intentional pun]. It’s going to be tough, but you’re going to have to carry it out. Q: What are your plans for 2017? 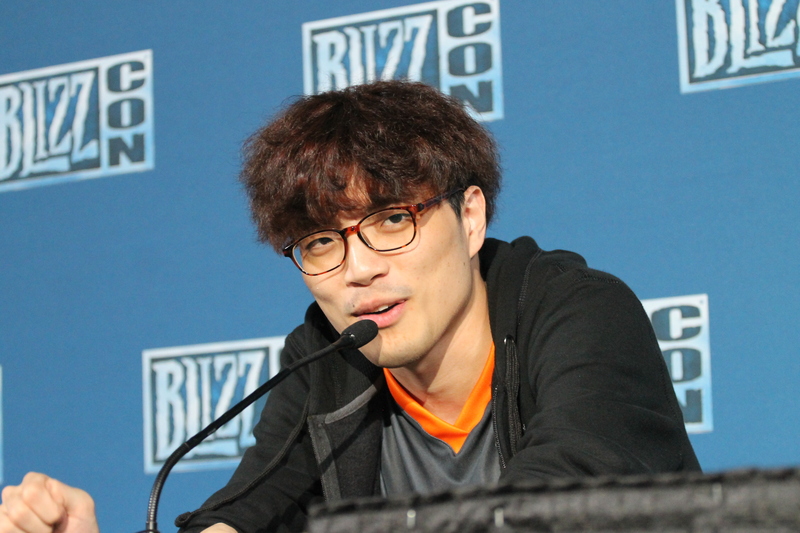 A: I was really hoping that they would announce the schedule for WCS 2017 at BlizzCon, so I’m a little disappointed that the news didn’t come out here, but obviously I’ll hear about it soon enough. Regardless of what the schedule is, I’ll stay in Korea. Hey, I won in Korea—there’s no need for me to move somewhere else. Q: Any shoutouts to anyone that helped you practice for BlizzCon? A: When I got here, I felt like the Round of 8 was by far my toughest match. I was about to go up against TY, who’s known for great TvT and is a great player overall. When I got here though, luckily INnoVation was here. Although he wasn’t here for BlizzCon itself, he was here to play in SHOUTcraft. He was sitting right beside me, so I peeked over and I asked him, “Hey, can you give me a hand in practicing for this matchup?”. Surprisingly, he said yes. He really helped me through, one by one, so I thank him a lot for that. Also, even though it was super late in Korea, people like Maru helped me out a lot. A lot of the terrans in Korea helped me a lot, they’ve all been on my side, and there have also been foreigners. I’m sorry, but there have just been so many that I can’t remember them all, but thanks a lot! Q: How heavy’s the trophy? A: You know, someone before told me that the trophy’s 20 kilograms. Whoever told me that is a complete liar. I’ve lifted 20kg rice packs over and over again in my life. Everyone knows that my wrist is not very good, and you had me carry it out for photoshoots anyway. I was thinking, “Should I do it, or should I not?”. It’s heavy, heavier than 20kg! Q: You’ve had one biggest fan, one biggest supporter throughout your entire career. Of course, I’m talking about your puppy. What will you buy for your puppy with your prize money? A: Hey, you know, I give him treats a lot. I spend over two grand a year, just on treats. But, you know, with him being the greatest supporter, I guess I owe him a little more. ByuN: One final thing; I wasn't given an opportunity to thank my team, Team Expert. Thank you very much for all your support, I really could not have done this without you. lmao Patience overslept but Neeb was there at 8am to practice :D. That does not fit the korean vs foreigner stereotype. Really cool interview. Nice to see him having support of so many players. p.s: is "the best day of my career -Byun" a meme already or what? ...nice interview, thanks! ByuN seems such a nice person! That blizzcon title added to a GSL win definitely boosted his confidence, but the interview isn't that odd for a korean progamer who had to climb to the top by himself. He wasn't mean at all - sitting in a room with him, seeing his smiles, I can say he was very nice during the interview. I think the way he looks at it is: I've practiced the hardest, I deserve to be where I am the most. Didn't think he was mean at all. Just confident and ecstatic. Winning 200k over the best Zerg in the world on the biggest stage of the year to become the world champ should do that to you. I didn't find him particularly likable in the interview but nothing mean-spirited. People complain about faceless Koreans for years (why they continue to be a part of this community if they dislike Korean culture so much is beyond me), and when someone finally steps up to take PartinG's shoes (although without going full MC) you instantly get posts like this... it really boggles my mind man. Completely agreed with your post. Holy crap what a good interview. No minced words, no coy "Well we'll see". Straight answers coming from the undisputed champ. Thanks for translating Mal, thanks for asking the questions everyone, and thanks thecrazymunchkin for transcribing it all for us! Poopi, the "people" in this case, has been around the block and was there for Byuns debut. Although I agree that the phrase faceless korean isn't very palatable I would not accuse him of saying it. In Byuns case, who gained notoriety from the word go, it isn't applicable either. We can hash out whether it is unfair to characterize mid level Koreans coming to foreign tournaments and scooping up prize money as unhealthy, and whether region lock has been successful. But I don't think this is what Poopi's on about today. He's just saying that Byun was very blunt and we're very used to Koreans (and pro gamers in general) being extremely reserved in their answers. I was there for ByuN's debut too. I was also there trying to calm the pitchforks during the ByuN/CoCa debacle when everyone was calling for their heads and I was lamenting how their overzealous reaction would cost two very promising players their future; fortunately, in the long run, I ended up being wrong about one of them. Yeah I wasn't accusing Poopi of bringing up that cancerous mindset, merely that people complain about it for years and when someone else breaks the mold again there's always someone there in the front row to go like "that was mean, disrespectful, etc.". There's always someone. Awesome interview! Thanks a lot, and really nice from him how he takes aspects of foreigner gameplay but adapts them with his mechanics and own style. Also, what a likeable guy, seriously, his honesty and confidence in the answers are really great. Absolutely deserved both titles. Matthew 5:10 "Blessed are those who are persecuted because of shitposting, for theirs is the kingdom of heaven".